When North Korea isn't firing intermediate and long-range intercontinental ballistic missiles (ICBMs) from highways and hidden factories, they're firing hellish amounts of smaller artillery. For the past several years, some of the recipients of these displays of military might have been two small islands off the coast of Wonsan. The islands of So (So-do) and Hwangto (Hwangto-do) have been pummeled multiple times. Most recently in April and August 2017, December 2016, and March 2016. 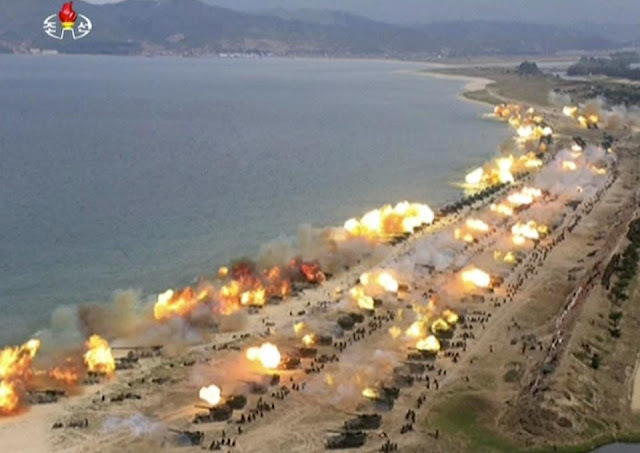 This video, originally from the Korean Central News Agency, discusses the August drills and shows images of the islands. Both islands lie off the Kalma Peninsula, which is where the Kalma Airport is located (North Korea's recently modernized airport). Kalma is also the site of two rocket launch pads and has seen at least one failed rocket test. So Island is approx. 6.7 km east of the tip of Kalma (among a small group of islands) and, farther south, Hwangto Island is 2.45 km east of the beach. At the tip of the peninsula are several villas, a sanitarium, and a possible hotel. Without further ado, here are the island martyrs. So Island has a more recent history. Prior to 2014, the island appears to have served as a small outpost, perhaps for local fisherman. It contained a few buildings on the western side, and the rest was left alone. The buildings were demolished in late 2014. So Island is a mere 460 meters by 293 meters at its widest points. As noted earlier, So Island was the target of an artillery drill in December 2016. The image below shows the results of that barrage. 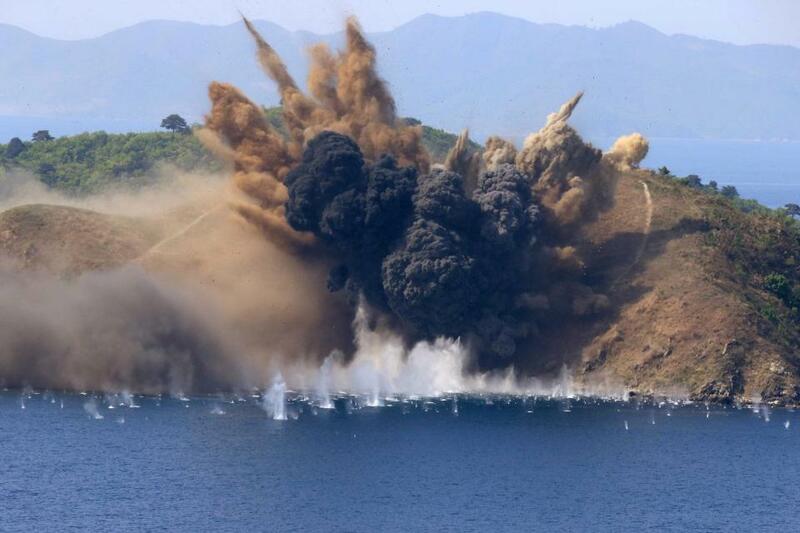 This is a picture from the Korean Central News Agency showing the island being hit during the 2017 drill. The large island seen the background is Sin-do. Next is Hwangto Island, which has a longer history of being a bombardment target. Hwangto is slightly larger than So at 587 meters by 295 meters. In the image below, shelling damage can be seen from a drill that occurred not too long before May 17, 2011. There is also a small building that has been demolished. On both islands, the structures seem to have been manually demolished rather than destroyed as a result of artillery. The above image shows the various prepared firing positions along the beach at Kalma. These sites are angled to line up with the the target on Hwangto Island. In this KCTV picture from April 2017, the firepower displayed is rather impressive. An estimated 400 pieces of artillery were used. The below image is the most recent on Google Earth. Dated Dec. 8, 2016, you can see the damage done from additional artillery drills as well as a new target. That target was used during the April 2017 drill. Thanks to the support of OpenDPRK, I can now show you the results of this recent onslaught. The largest craters are 10-13 meters in diameter. These displays of might happen a few times each year and usually coincide with major holidays or as a response to US-ROK drills. 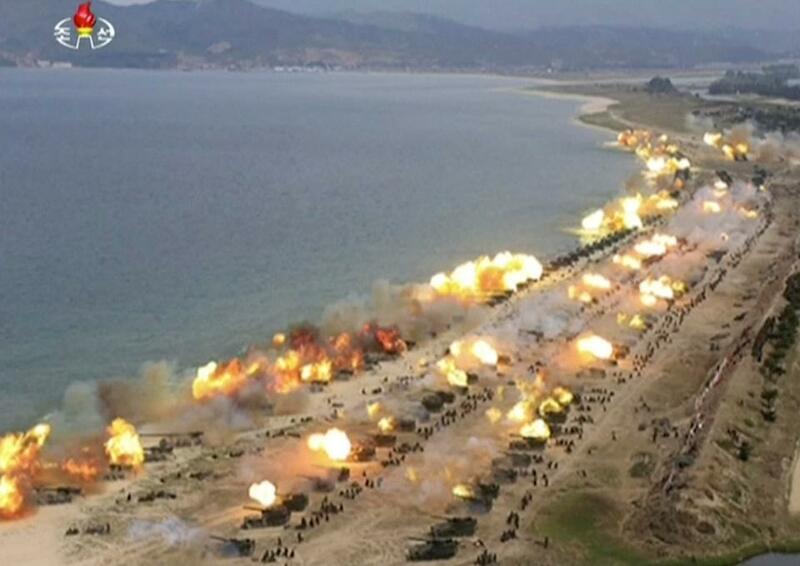 I wonder how many more artillery drills it will take before the cliffs at So Island collapse? Once again tensions are high and concerns of impending nuclear Armageddon can be heard from some of the more embellishing talking heads on cable news. North Korea's nuclear and ballistic technology has rapidly advanced under Kim Jong-un and their path towards becoming a fully capable nuclear weapons state is appearing much shorter than many had projected. Kim Jong-un has tested more missiles than his father and grandfather combined, and the individual components of a nuclear-tipped ballistic missile capable of hitting the US mainland seem fairly complete. The main hurdles now revolve around joining those components together into a functional weapon. That isn't to say North Korea is only a matter of days or weeks away from having a true nuclear missile: the mating of a miniaturized warhead onto a missile has its own difficulties, and there are other questions surrounding the program. But with North Korea threatening to fire missiles into the sea near the US territory of Guam (a major cornerstone of our ability to operate in the Pacific), and with President Trump likewise threatening "fire and fury" against any Northern threat, many question why we're even involved in Korea in the first place, and why do we care. Particularly among younger generations. After all, the Korean War earned the moniker "The Forgotten War" in my father's generation. If it was "forgotten" then, how much more distant must it seem to the proceeding generations? So, why are we there and why do we care? A little backstory is required. A unified Korea was occupied by Japan in 1910. After WWII, the USSR took over the northern half of the Korean peninsula and we took over the south with the agreement that at some point in the near-ish future, a free and general election would be held under UN supervision so that the Korean people (they’re all the same blood) could decide if they wanted to be a free and democratic country, or set up a communist state. That election never happened. The Soviets took a small-time anti-Japanese guerrilla fighter named Kim Il Sung and installed him as leader, and we put in the Harvard and Princeton educated Syngman Rhee. Both sides claimed to represent all of Korea (even now, defectors who make it to the South are automatically granted citizenship) and both sides wanted to reunite the peninsula under their respective systems. After a few years, the American and Soviet troops withdrew from Korea. Not wanting to wait any longer and assuming the US wouldn't come back to defend an Asian backwater, Kim invaded the South in 1950 with overwhelming force. However, since the United States pledged to help keep our new ally safe from Communism, we certainly did come back (under the authority of United Nations and with dozens of other countries directly supporting the war). The resulting war the North initiated left half a million Allied soldiers (including 140,000 Americans) dead or wounded, and over 2 million Korean casualties. No peace treaty was ever signed, but an armistice was signed in 1953, technically putting the war on hold. And our agreement with South Korea turned into a formal treaty, also signed in 1953, to which we are still bound. The Mutual Defense Treaty requires each country to come to the aid of one another in the event one is attacked. I feel it's important to note, that South Korea has sent troops and matériel to assist all major conflicts the US has been a part of since that time. As part of the terms of the Treaty, American forces were to be stationed in South Korea to help prevent another invasion. This "status of forces agreement" is updated every so often. But it's been 64 years since the armistice was signed! Why should we remain? Since the signing of the 1953 Armistice (which created the Demilitarized Zone -DMZ), North Korea has violated the terms of it over 220 times. North Korean soldiers hacked to death with axes two American soldiers on the southern side of the DMZ. North Korea captured the USS Pueblo and tortured its crew. North Korea has kidnapped hundreds of Japanese and South Korean citizens. North Korea has bombed South Korea islands, sunk Southern ships, and launched a raid on the South Korean president’s residence in an assassination attempt. They even continue to secretly lay landmines by infiltrating the DMZ. North Korea attempted another assassination attempt on a South Korean president, this time while he was visiting a foreign country. The bomb, planted in Rangoon, killed 21 and injured 46. Kim Jong-un also murdered own brother by using a WMD (VX nerve agent); the use of which in a foreign state is an act of terrorism. 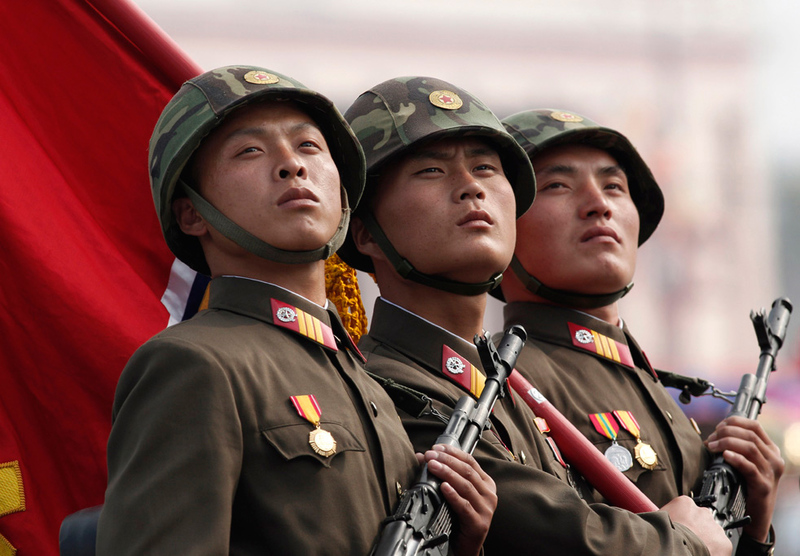 Even if you ignore the nuclear weapons (and their long-held desire to develop them going back to the 1950s, and their continual threats to use them), North Korea still controls one of the largest conventional militaries in the world. They have over 1 million active-duty soldiers, 180,000 special forces, enough artillery within range of Seoul to lob half a million shells into the city within the first hour, and nearly 6 million belonging to reserves and paramilitary organizations. Plus numerous underground and hidden sites throughout the North that store fuel, food, and munitions to launch a full-scale war and carry it out for 6 months before reserves run out. OK, but other than protecting South Korea, what do we get out of it? Besides keeping our word? The Korean peninsula has been a contested region for thousands of years. Its importance today has not diminished. 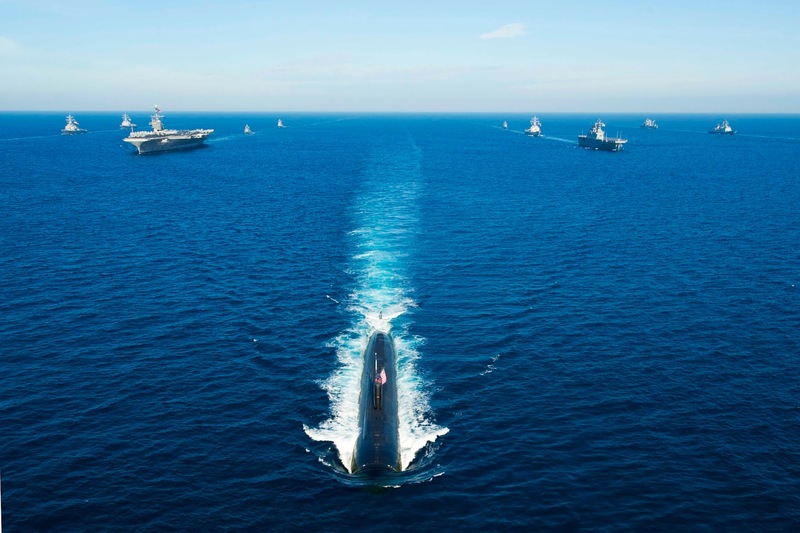 Some of the world's most important trading routes pass through and near Korean waters. The combined GDPs of South Korea, China, and Japan equals nearly $18 trillion, or more than 20% of the entire world's economic output. 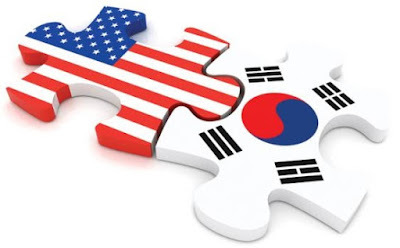 Bilateral trade between the United States and South Korea amounts to $112 billion annually (up from $82 billion since 2007). Globally, South Korea is a key production center of electronics like cell phones, LCD screens TVs, and semiconductors, as well as automobiles, shipping, and petrochemicals. 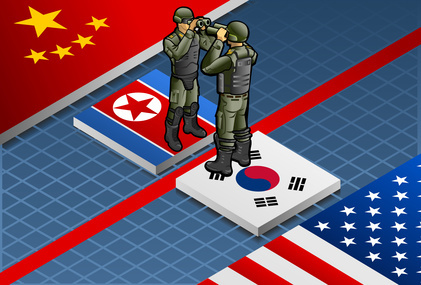 South Korea's impact on the global economy amounts to over a trillion dollars, and during periods of heightened tensions, global markets connected to the region tend to slow down and even drop until the immediate threats end. Aiding in the defense of South Korea enables that trade to continue to grow. It preserves the jobs of countless American workers who work for South Korean firms here and sell South Korean goods (and the many products that rely on parts from South Korea). It helps stabilize the overall world economy by keeping shipping lanes and factories open, allowing products that are vital to every industrial nation to get to their destinations. Despite signing an armistice to end hostilities, North Korea has a 64 year-long history of open and active aggression. In the event of a war, yes, they’d lose. That isn’t quite the point. The North wants to harass and intimidate South Korea into giving them massive amounts of concessions (which has happened before). They want to hold the South hostage via threats and cause them to weaken and buckle. And yes, they want to preserve their regime, but that regime's survival means not having to reform their economic and political systems. It means the continuation of starvation, torture, attacks against its neighbors, and the perpetuation of one of the longest-running prison camp systems in world history. The world is faced with a handful of choices that can be boiled down to two: do we accept a nuclear-armed North Korea, or do we prevent that from happening? The implications of either choice are not simple nor are they necessarily comforting, but the time to figure out which path we're going down is closer than ever. And despite which path we (and they) take, the fact remains, it is in America's best interest to help guide this long tale to its conclusion.